As a young man, he often listened to The Grateful Dead. These days, Tim O’Donohue is just grateful that he isn’t dead…anymore. 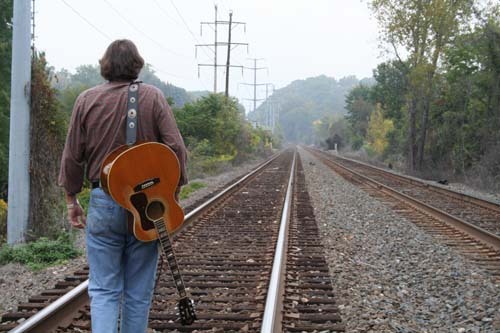 The lifelong resident of Rockland County, New York and a mainstay on the area’s Americana folk/country scene has released his first CD, entitled “A Little Bit of Alright.” The CD was produced by another Rockland County musician Joe D’Urso in conjunction with SCR Records. The release of the CD comes less than three years after O’Donohue was revived by doctors after suffering a massive heart attack. O’Donohue, once described as a cross between John Prine and Kris Kristofferson, has attracted rave reviews from several of his collaborators through the years. The CD features original music and songs written by others, including one by Rex Fowler of Aztec Two Step. D’Urso and his Stone Caravan band, a world re-known Americana/New Jersey/Roots Rock and Roll band, have released 10 CD’s to date and he echoed Fowler’s sentiments. O’Donohue calls the genre juke/country/grass/tonk music. The songs on the CD are: Happiness; Is Anybody Going to San Antoine; Broke Down; Central Line; Wondering Where The Lions Are; Keeping Score; Are My Thoughts With You; Gold; Killing Me; Where’d You Hide The Body: No Place to Go; Ballad of Lou The Welterweight. O’Donohue has performed at numerous East Coast venues through the years with The TMU Band and Last Stand also in a duet with “Cousin” Dave McKeon. The new CD features Dave McKeon on mandolin, banjo, Martin acoustic guitar & vocals; Craig Sheppard on drums, harp & vocals; Dave Gross on mandolin & vocals and Gordon Roeher on bass. Also featured on the recording are two bluegrass bands, McMule and Blue Plate Special. Various other Rockland County musicians also contributed to this project. Although no major distribution deal has been finalized yet, the CD is available for purchase at www.timodonohue.com. A release party for “A Little Bit of Alright” was done on Sunday, December 14 at The Turning Point, Piermont, NY, which boasts an alumni network including 35 members of the Rock and Roll Hall of Fame. Visit http://www.youtube.com/user/timodonohue for video of the show. We're back at our favorite place in Rockland!!!! We're all ready and hope you are too!!!! A TMU Band show with some special quests. It's cheap beer & wings! Bring the kids! I hope3 to see you at one of our shows!!!! Have fun out there and support live music and the people who make it. Go Out And Hear Some Live Music As Soon As You Can!